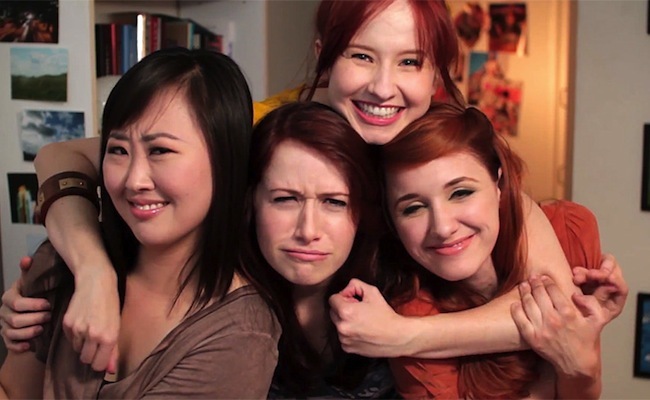 March 28 marked the end of ground-breaking new media series The Lizzie Bennet Diaries (LBD). The brainchild of Bernie Su and Hank Green, the series was a modern interpretation of the Jane Austen classic Pride & Prejudice. The series also successfully experimented with several interactive and transmedia practices, such as creating Twitter accounts for the characters to have them interact with each other, programming off-shoot video series for secondary characters, and more. Oh, yes, and it won a Streamy Award for this very reason. Some of us have been watching LBD ever since the beginning, and others have popped into the audience mid-way through. But others have been involved far longer, like the series’ writers. What might they be feeling now that all their hard work has come to a close and the second chapter in their transmedia world is just beginning? I chatted with a few members of the LBD writing team – Rachel Kiley, Margaret Dunlap, and Jay Bushman – about writing for the show and all that it encompassed. Tubefilter: What challenges did you face in adapting an old story to new media? Margaret Dunlap: The thing that actually had me most worried was how we were going to deal with the book’s multiple points of view. While most of Pride and Prejudice centers on Elizabeth Bennet, Jane Austen actually steps away from her quite a bit, telling us things that Lizzie doesn’t know about, or directly commenting as the third person narrator about what Elizabeth is thinking or saying. That’s where a lot of the humor and the social commentary comes from in the book, but The Lizzie Bennet Diaries is about as first person as you can get in a video format. It was always a balance to try to show the audience where Lizzie was being accurate when she tells us about other people, and where she was being blinded by her own opinions. Jay Bushman: The challenges are also the fun parts – finding ways to change the context of what’s going on so that the actions the characters take make sense in our modern world, continually finding reasons for [characters] to be OK with putting themselves on camera, always having to keep one eye on the internet to see what the fans were doing and how they were reacting, in case we need to adjust something – with a small team and not a lot of resources, that was a huge challenge. And when a huge plot point was a website being taken down, and then the server hosting that site had an outage a week too early, triggering the audience to think an enormous story event had occurred, forcing us to create a new Twitter account to dispel that idea… let’s just say Jane Austen never had to deal with that. Rachel Kiley: You have characters like Lizzie and Lydia and Fitz and Wickham and a couple others who would absolutely vlog and say things to thousands of people without thinking twice about it, but it’s a little bit more difficult to justify that with some of the other characters sometimes. And there were definitely situations we felt we really needed to see on the vlogs that, realistically, probably would have been edited out if this had been a real vlog, or posted in an emotional state and then deleted afterwards. So it was a constant attempt at striking a balance between realism and telling the story in the most effective way. TF: What was your favorite episode to write and why? JB: On the transmedia side, I really loved writing all of the intial Twitter conversations between Bing, Caroline, and Darcy about Netherfield, and of course Caroline’s ill-fated attempt to cook Thanksgiving dinner. The final postscript was a lot of fun, too. MD: I think if I had to pick a favorite episode to write it would be 96. I knew it was going to be my last episode for the series, and a key moment for Lizzie where she realizes that if she wants to know how Darcy feels about her, she’s just going to have to pick up the phone and call him herself. I knew I wanted it to be a Lizzie solo episode–which we’d only done once before–but once I came up with the idea of her doing costume theater of *everyone* over the course of the episode, it all fell into place. I couldn’t have asked for a better way to say goodbye to writing for Lizzie. RK: Probably episodes 73 and 74 (“2 + 1” and “How to Hold a Grudge“). That’s when we finally see all these years of misunderstanding and bottling up feelings between Lizzie and Lydia just finally explode, on both sides. It was great to have to explore and fully identify with both sides of their argument, and also to know that people who hadn’t been watching Lydia’s story on her own channel were finally going to see those occasional cracks in her otherwise cheery disposition for what they were. That’s always exciting as a writer, to see the payoff when people clue in to what you’ve been layering in quietly for a long time. TF: Looking back, how do you think the show changed or shaped online web series? MD: One specific place where I think LBD has had an impact is the way we’ve baked the “transmedia” elements into our story. Things like the Twitter accounts for the characters, or Jane’s Lookbook, or Gigi’s “This is my Jam” account aren’t just bolted onto the videos, they flesh out the characters as people and help reveal more of the story than you’d get if you only watched Lizzie’s YouTube channel. It’s been great to be recognized for that and hopefully we’ve both raised the bar and paved the way for other series. RK: I think a lot of people (correctly) assume that only a small percentage of their audience will become invested in any transmedia aspects, so they don’t think it’s worth putting in the effort, but what they maybe overlook is that giving fans something to invest in and a world to immerse themselves in is how you make your audience really care. And if they care, and they’re passionate about your story and your world, they’ll share it with other people, and that enthusiasm becomes contagious and spreads to others. 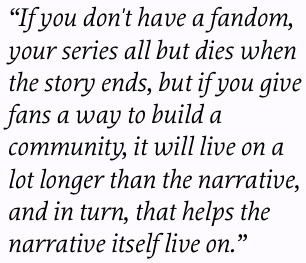 If you don’t have a fandom, your series all but dies when the story ends, but if you give fans a way to build a community, it will live on a lot longer than the narrative, and in turn, that helps the narrative itself live on. JB: I hope that other web series producers take a look at integrating transmedia elements into their shows more deeply and with more forethought. It’s tempting to think of things like Twitter as so ephemeral and in the moment that it doesn’t require a lot of planning or resources, but I’m hoping we’ve changed some minds about what you can do with them. TF: How did the show change your own life? JB: I’ve been working in various forms of transmedia storytelling for many years, and for most of that time its been a struggle to explain to people a) what the heck it is and b) why you would even want to do something like that. After this show, I’m hoping I won’t need to do that as much. MD: LBD has really been my introduction to the community of web video. The television show I’d been working on had just ended when Bernie recruited me for LBD with the promise of low pay and creative fulfillment. (So how could I say no?) It was a whole new world for me, and my life and my work are both richer for the cross-pollination. RK: I’ve been able to go from “Okay, so, I’ll work as an assistant for like maybe a decade and hopefully eventually get a job on some show and maybe sell a script another five or so years after that and then maybe…” to having a group of really talented people I want to work and who want to work with me and knowing that if we make anything, there are people out there beyond my mom and random friends from high school who will at least give it a shot. And that’s really all you can ever ask for. If you want to see more of what these writers may bring you in the future (like that spin-off mini-series called Welcome to Sanditon), don’t forget to follow Rachel, Margaret, and Jay on Twitter! Bree Brouwer is a freelance blogger and writer, and an aspiring new media and video games journalist. She blogs about geek and pop culture at Geek My Life, where she’s also developing a free alcoholic drinks ebook based on superheroes – get it as soon as it’s released by signing up for her email subscription.